I encountered a snake sunning himself on our front porch in early June, then regularly on late afternoons which followed. Turns out these snakes are common in our area and this one had found a cozy place behind our steps. I was disturbed and unsure what to do. Some friends said to kill it lest it reproduce and we wind up with an infestation of snake babies. Others suggested finding ways to share space with the snake, noting ecological value. Both suggestions had merit, though the thought of killing a snake made me queasy. So, undecided, I didn't actively follow either suggestion, and mostly developed a pattern of avoiding the snake. In the midst of my indecision, I did some research about snake repellents, traps, and euthanasia. I read about several ways to kill snakes, along with the perceived humaneness of each. Folks who really like and appreciate snakes weighed in, too. I learned quite a bit, just didn't do anything. Meanwhile, the snake mostly disappeared for awhile, which I mostly appreciated. But then it showed up suddenly as a friend approached our home one evening. She yelled and flailed, and they both evacuated the area. More days went by and it seemed again that perhaps the snake had moved away, until it suddenly appeared between my bare feet (!) as I was walking outside one evening. Again there was flailing, mutual evacuation, and no more snake. This creature was getting bigger, but the times between its appearance were getting longer. Maybe I could ignore it and it'd go away. That sounds reasonable, right? I believe this is what my junior high English teacher called "foreshadowing," because there is clearly more snake in the shadowy future of this story. That future came on a Thursday as I was heading across the driveway, talking on the phone, mind in many places at once. 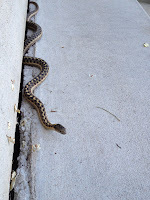 An itty-bitty snake, maybe six inches long and thin as a pencil, suddenly darted in front of me. It was disconcerting, like a dry, scaly, and really fast-moving earthworm. The quick motion created a sense of urgency. I didn't have a shovel, but did have sturdy shoes and a burst of adrenaline, and that was enough. ...where I encountered another in the grass, with similar result, except that ten minutes later, this "dead" one slithered away while I wasn't looking. So not only was I hating that I'd killed something, now I also had the guilt of having left one wounded and in pain. I'm hoping that's the one that slipped under the lawn mower soon after (and got mulched). Another one appeared by the fence post (shovel), and yet another as I trimmed the bushes (hedge clippers). A fifth slipped by and escaped as I dealt with the fourth. Ugh, ugh, ugh, and ugh. In the midst of all these encounters, I kept seeing movement in the grass running along next to the lawn mower. Certain that any remaining snakes were disturbed, I wondered whether they were just trying to get away or were actually attempting to threaten me. It took several laps around the lawn before I realized all that movement was just blades of grass being pushed around by the hot air of the mower's exhaust. And that was all just the front lawn! I never did get to the back half on that day. And I was okay with that, because in my imagination, the flower beds and rocks back there now held a slithering mass of these critters. Worn out, I went inside, grateful for walls and stairs and doors to separate my world from theirs, yet uncomfortably aware of their lurking presence nearby. But this isn't just a story about snakes. I've also come to see it as a story about conflict. Conflict happens, appearing unexpectedly and catching me by surprise even while I know full well it is very much part of the human experience. Some people, feeling quite threatened, instinctively want to killitquicklynomatterwhatjustmakeitgoawaynow. Others appreciate its value in the relational ecology and suggest giving it space to stay. Both responses have some merit, neither is the full truth, and the best approach in a given situation can be tough to discern. But indecisively avoiding conflict and just letting it have whatever space it takes is never a good idea. Boundaries are necessary. Discernment is so vital because, when conflict establishes its home, it does not simply disappear. It keeps popping up, often unexpectedly and at unfortunate times, when we're least prepared for it. And when opportunity presents itself, conflict tends reproduce. Unhealed rifts darken perceptions of others, so that even mere difference of perspective creates a breeding ground for all sorts of new conflicts -- ambiguous statements are interpreted, gossip spreads, motives are questioned, imagination takes hold and cultivates fear which triggers attacking or avoiding rather than dealing with issues in a healthy and reasonable way. And when caught by surprise, we tend to react to conflict like I did to the snakes -- flailing, stomping, yelling, and generally just making a mess -- while there are much better ways to go about it. I had an epiphany during a workshop awhile back when the topic of conflict came up. A participant commented that everyone hates conflict, and I had the sudden realization that that's no longer true of me, that I no longer hate conflict. It can be quite uncomfortable and I don't actively seek it out, but I have found myself developing a healthy respect for conflict, even appreciation. Handled well, conflict cultivates growth as we challenge each other appropriately, seeking to redeem our differences by attending to the relationship while pursuing truth and resolution together. Like snakes keeping the rodent population under control, conflict has helped to cut down such figurative pests in me as misunderstandings and character issues. So I am learning to ask: Is this conflict the simple garden-variety kind or one of those really poisonous ones? What's at stake if I bring it up, and what's at stake if I don't? What boundaries do I need to establish, and what boundaries do I need to honor for the other(s) involved? Am I pausing to discern the best course of action or just avoiding what is difficult in hopes that the problem will solve itself? What do I need to learn in this situation? What seeming "threats" are really just perceptions based on fearful expectation more than on reality, the result of my own hot air stirring things up? Like snakes, conflict really does have a place in the ecology of life. And, also like snakes, it must be handled with care to keep it from becoming an infestation -- an out-of-balance, uncontrolled force which threatens the health of the whole relational ecosystem.